Gone are the days when cars were simply used as a means of transport, now the factor of maintaining a status quo in the society depends largely on owning luxurious and expensive cars. Luxury is now the primary requirement we look for in everything, no wonder automobile companies are flooding the market with vehicles with the best of technology. Considering the most expensive vehicles, pricy cars seem to attract the attention more than any other automobile. But who could have imagined that cars could cost as much as $8 million someday? This year the automobile industries didn’t mind staying back in bringing the best of their technology out in the public with prices that could cost you a fortune. 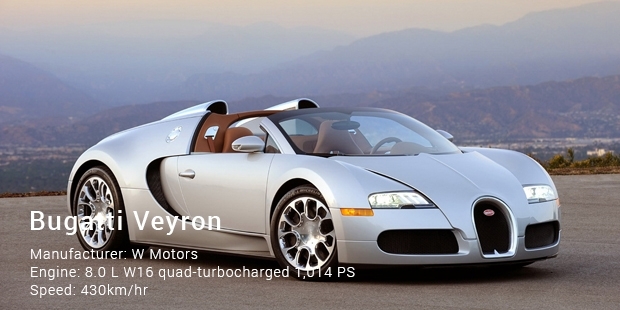 Here is the list of the most expensive cars in the world today. The fantastic Exelero tops the chart of the most expensive cars in the world today on being priced at $8 million. The sleek beauty has an incredible speed of 351km/hr with ultra-high efficiency and performance. 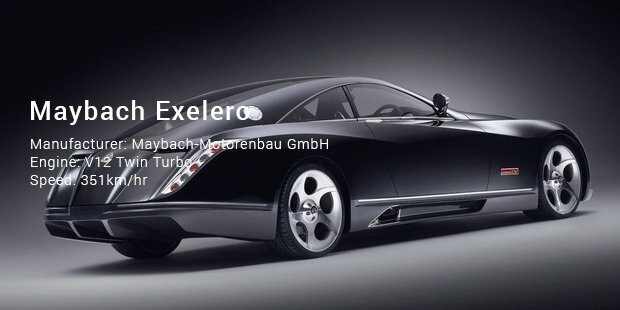 The Maybach’s masterpiece is powered by a twin turbo V12 engine while it flaunts a new generation of wide tires. 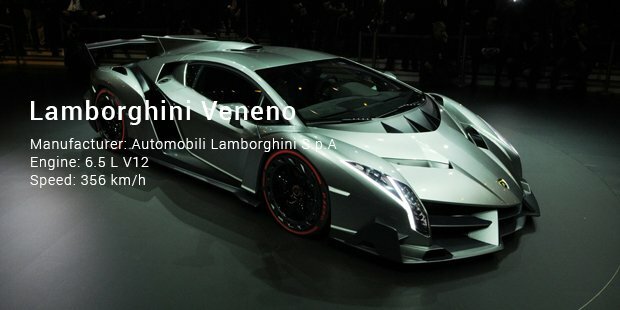 The stylish Veneno by Lamborghini is described as one of the strongest cars the company has ever come up with. This superb vehicle, powered by a 750 horsepower 6.5 liter V12 DOHC engine, is priced at $3.9 million. It can go up to a maximum speed of 355 km/hr and comes with a 7 speed transmission. But sadly, only three of the cars are manufactured, booked and sold. 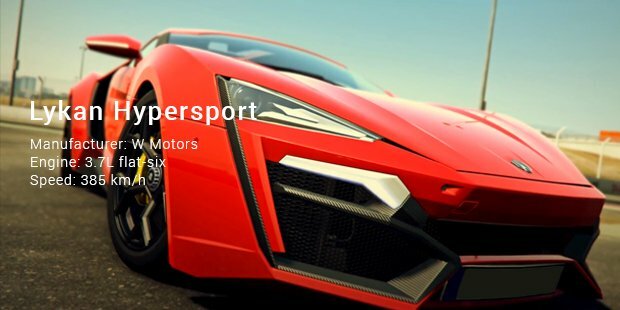 Lykan’s Hypersport is a product of a Lebanese supercar company, W Motors, and is a super car with a price tag of $3.5 million. It's set to launch this very November, 2013 at the International Dubai Motor Show. The company has announced that they plan to produce only seven units of this car and all of them will have rubies and diamonds in the headlights. The buyer of the car has an option to choose and make changes to the design or quality of ruby and diamonds embedded at the headlights. The amazing Bugatti Veyron is manufactured by Bugatti Automobiles, but designed and developed by Volkswagen and is priced at $2.6 million. Known for its high performance, the car is the legal fastest and most expensive road car. It comes with a jaw-dropping speed of 430km/hr powered by an 8 liter W16-Cylinder, Quad Turbocharger engine. This incredible product is sleek and brilliant in its appearance, and also has everything a supercar needs but yet it is surprisingly not the costliest. 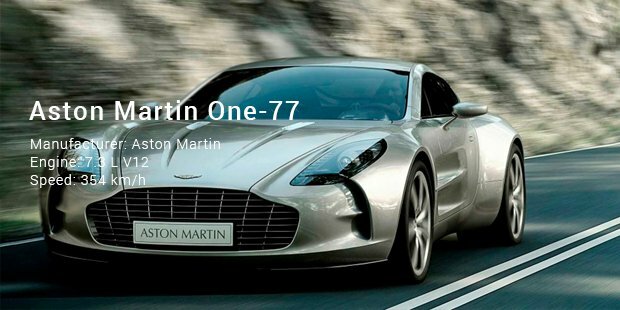 The Aston Martin One-77 is a fantastic looking car, elegant, classy and is powered by a 750hp, 7.3 liter V12 engine. It is priced at $ 1.85 million and can go up to 230 mph that is 354 km/hour. The aluminum body panels are hand crafted, the headlights are single bi-xenon and interior designing are absolutely stunning. The high-performance vehicle also features Carbon Ceramic Matrix brake system, which proves beneficial while racing on the roads.